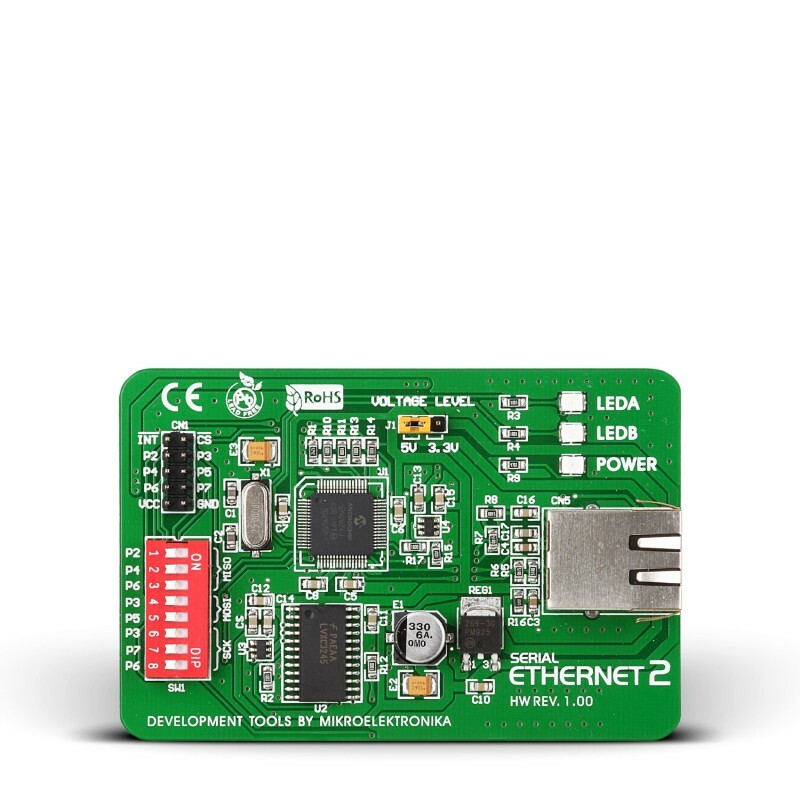 The Serial Ethernet 2 Board is an accessory board that contains ENC624J600 (stand-alone 10/100 Base-T Ethernet interface controller with integrated MAC & PHY, 24-Kbyte RAM buffer). Board is designed to serve as an Ethernet network interface for any microcontroller equipped with SPI. Serial Ethernet 2 board pushes the boundaries of speed and flexibility in Ethernet applications. It has Microchip's latest ENC624J600 10/100 Base-T Ethernet controller with integrated MAC & PHY, hardware cryptographic security engines and factory preprogrammed unique MAC address. Communication is done via industry standard Serial Peripheral Interface (SPI). Small footprint and easy connectivity using ICD10 connector were not our only concern. We carefully implemented flexible voltage level selection and communication pins selection using on-board DIP Switches, so you'll be able to use the board with various architectures and MCU families. On-board modules Microchip's ENC624J600 10/100 Base-T Ethernet controller. Key Features Factory Preprogrammed Unique MAC Address. Supports Auto-Negotiation. Supports Half and Full-Duplex Operation. Hardware Security Acceleration Engines.